We were featured on the Physics and Astronomy Department website! 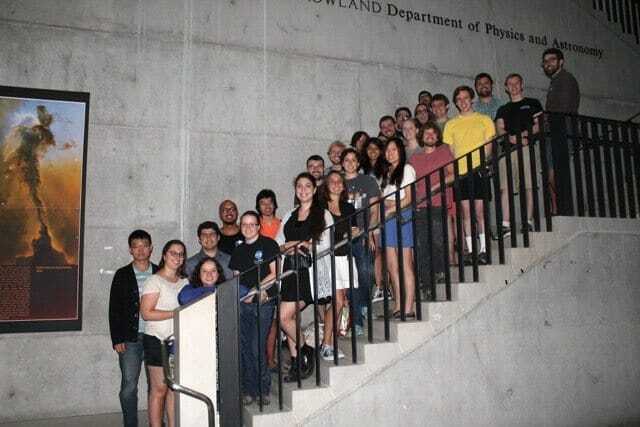 Check us out here: http://physics-astronomy.jhu.edu/physics-and-astronomy-graduate-students-volunteer-at-stem-recognition-event/. The PAGS outreach organization was started in the spring of 2012 by Alexandra Greenbaum with the goal of harnessing the resources of this department to improve science literacy in Baltimore city schools and the greater Baltimore community. We visit local schools and libraries with our portable planetarium, and invite the community to the Bloomberg Center for Physics and Astronomy for observing nights on our rooftop telescope and department-hosted outreach events. Our outreach events feature planetarium shows, hands on demos, and virtual reality headsets to engage with as wide an audience as possible. We are always interested in new activities and partnerships with the Baltimore community. If you have any questions, or are an educator who is interested in finding out how we can work to complement the physics curriculum at your school, please contact us or visit our website (http://pagsoutreach.wordpress.com/) and Facebook page (https://www.facebook.com/PAGSOutreach)!